This brand new luxury waterfront rental condo is located above a 55 room hotel on the Saanich Peninsula on Vancouver Island, in beautiful British Columbia, Canada. Imagine waking up in your private home one morning, deciding you don't feel like making breakfast, so you order room service. Or maybe you need to relax, so you head downstairs to the spa. The condo's residents have access to all the services of the hotel below,including a fitness centre, street side cafe & deli and a west coast oceanfront restaurant. The city of Victoria, British Columbia is only a 20 minute drive and both the Victoria International Airport and the Swartz Bay Ferry Terminal are only minutes away, as is the world famous Butchart Gardens. As the ocean side gateway to the Gulf Islands and San Juan Islands, and with all that is available on the Saanich Peninsula, Sidney offers access to a myriad of recreational activities including sailing, kayaking, scuba diving, whale watching, golfing, cycling and hiking. The town of Sidney is located on the Saanich Peninsula of Vancouver Island, in beautiful British Columbia, Canada. Victoria city is only a 20 minute drive and both the Victoria International Airport and the Swartz Bay Ferry Terminal are only minutes away, as is the world famous Butchards Gardens. As the oceanside gateway to the Gulf Islands and San Juan Islands, and with all that's available on the Saanich Peninsula, Sidney offers access to a myriad of recreational activities including sailing, kayaking, scuba diving, whale watching, golfing, cycling and hiking. 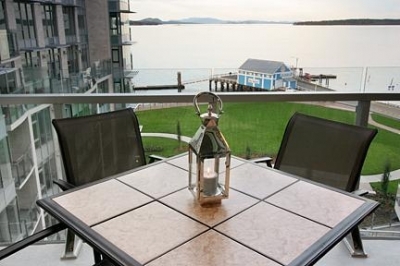 The Pier Condo is located at 9851 Seaport Place, right at the foot of Beacon Avenue, on waterfront property, over looking the beautiful Sidney Channel and the historic Sidney Docks and Fish Market.